The Tucuma Butter has been obtained from the fruit of the Brazilian Amazon tree (Astrocaryum Tucuma). The large fruits are edible and valued for their flavor in South America. 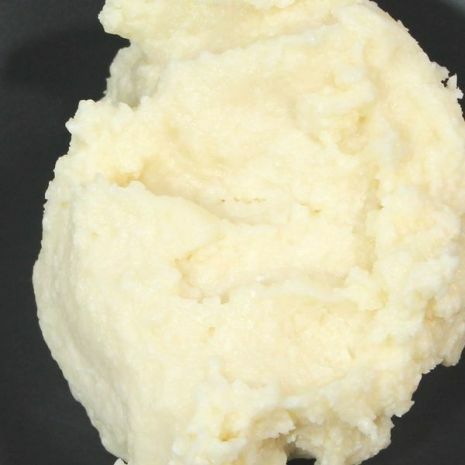 From it's seeds a light colored butter is obtained which has a unique, characteristic odor and behavior similar to Murumuru butter. The butter's natural gloss brings a desirable shine to dry, damaged hair and can act as a wonderful skin moisturizer, exhibiting great lubricity. Tucuma Butter is solid at room temperature, but melts immediately on contact with the skin. Tucuma's great emolliency and skin feel come from its high levels of Lauric, Myristic, and Oleic fatty Acids. At first I did not like this butter. I had whipped it with vitamin e and a bunch of other oils. It was extremely greasy. Later I decided to just warm a piece of pure tucuma butter in my hands by rubbing my hands together and applied it to my hair-My hair loved it, makes it shiney and moisturized. The smell dissipates and is not noticeable. Do not mix with anything else for best results. Works on damp or dry hair.